If endlessly scrolling through the news on your smartphone has you feeling anxious, it might not just be distress about current events. New research from The University of Toledo has found a link between what psychologists call intolerance of uncertainty and problematic smartphone usage — particularly when the use isn’t for social interaction with others. 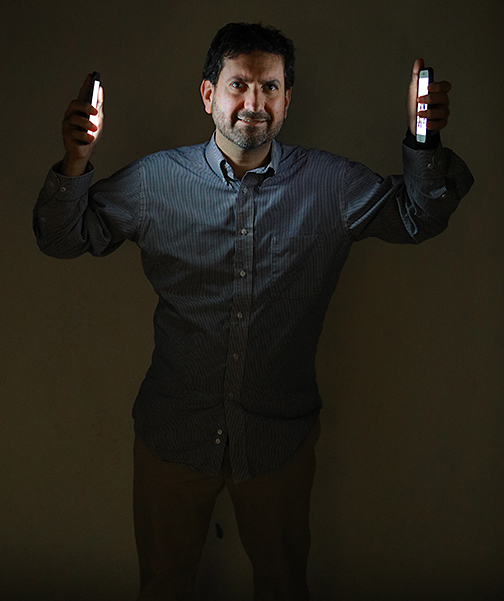 A new study about problematic smartphone usage by Dr. Jon Elhai, professor of psychology, was published in the journal Computers in Human Behavior. “We know from the past that anxiety is related to problematic smartphone use. We wanted to extend this line of research by examining intolerance of uncertainty,” said Dr. Jon Elhai, professor of psychology, whose research focuses on how some can develop harmful relationships with their smartphones. Elhai and his team, which included Dmitri Rozgonjuk, a doctoral student from Estonia who was hosted at UToledo as a Fulbright Scholar, compared scores indicating problematic smartphone usage and intolerance of uncertainty, a type of anxiety where an individual worries about the future and not being able to control things that are beyond his or her control. They found a strong correlation between that anxiety and non-social smartphone usage, which includes things such as reading news, playing games, or sorting one’s calendar — anything that involves little to no interaction with others. No link was found between intolerance of uncertainty and using one’s smartphone for social engagement such as texting or sharing links on social media, even if they spent a lot of time using their smartphone. The study was published recently in the journal Computers in Human Behavior. In a way, the findings suggest a feedback loop. The more anxiety someone has, the more likely they are to dive into their smartphone looking to ease their uncertainty. That excessive use correlates with problematic non-social smartphone usage, which in turn feeds the intolerance of uncertainty. Elhai, who has co-authored more than a dozen papers looking at links to problematic smartphone usage including fear of missing out and anxiety and depression, said the findings are an important piece in understanding potential causes for problematic smartphone usage. This entry was posted on Wednesday, April 17th, 2019 at 3:55 am and is filed under Arts and Letters, News, Research, UToday .